Most damage happens because of carelessness, but occasionally there’s another reason. This was one of those times. Lia and I used to go to Paris several times a year on buying trips. It’s a tough job, but somebody has to do it. We haven’t gone in quite some time, mostly because of the dollar’s weakness, making domestic buying more attractive. 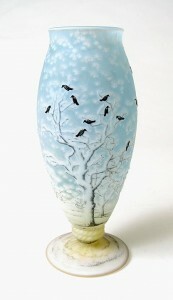 On one particular trip we bought some lovely items for resale, including one very special Daum vase with blackbirds. 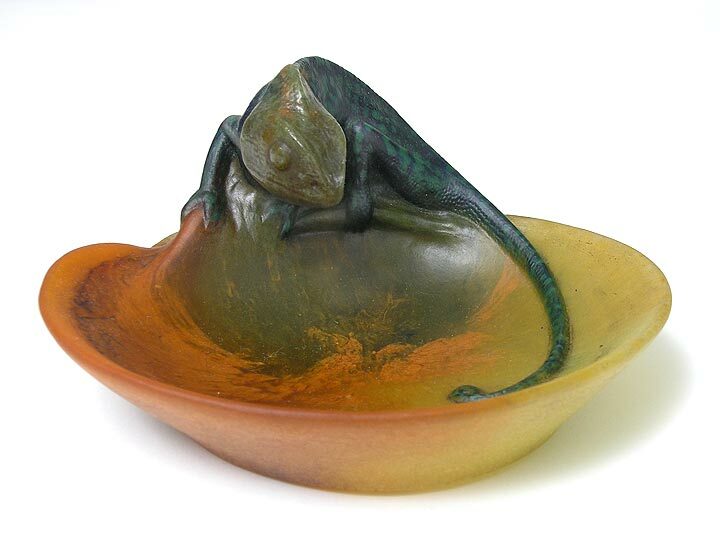 It was a beautiful example with lovely color and a great shape with an applied foot. Blackbird decoration is one of the rarest and best decorations. 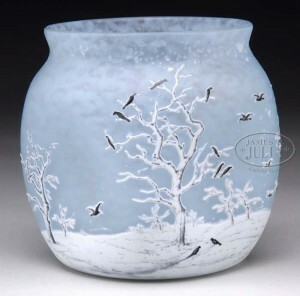 Just this past weekend at Julia’s lamp and glass auction, a beautiful Daum 5″ vase with blackbirds sold for $12,650, including buyer’s premium. When a vase is dirty, I usually clean it before putting it up for sale. So I took it to the sink, sprayed it with some cleaners and scrubbed it clean. I held it by the foot and turned it upside-down to let the excess water drain. Then to my utter astonishment, the body of the vase separated from the foot and dropped to the floor, smashing into many pieces. I stood there motionless for a while, incredulous, trying to understand what had just happened. Finally, I got around to examining the foot and noticed that there was glue residue on it. Daum vases are not made with glue, so that meant that someone had reattached the foot to the body. LUCKILY for me, I hadn’t paid for it yet. I called the dealer in France to tell him the bad news. He had sold me a restored vase and therefore it was not my responsibility. I emailed him photos of the disaster and ultimately gave him back the pieces. He said he didn’t know it was restored, but someone, somewhere, along the line of possession was responsible for the restoration and no one was willing to own up to it. To the best of my knowledge, the dealer who sold the vase to me took the loss. He tried to go back to the person who sold it to him, but that person refused to accept responsibility (or so he said). You can’t live the life of a lamp and glass antiques dealer without getting burned once in a while. So, a story or two seems in order. About 25-30 years ago, way before the Internet era, I advertised some items for sale in a monthly magazine, Hobbies. It was a big deal to advertise back then. I had to take black and white photos, get them processed (there was no 60-minute photo) and mail them, with the advertising copy, to the magazine and about 6 weeks later, the ad would appear. Getting long distance calls at the time was very exciting. They were expensive, so I got very few. A gentleman called from the Midwest and purchased a vase from the ad. A short while later, we sat down to have dinner and heard a crash from the curio cabinet behind us. 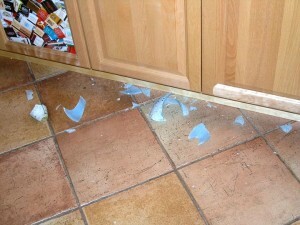 I turned around to see that the very object I had just sold slipped off the shelf and broke into a million pieces. No other object was affected. Really spooky. It felt like this one object had committed suicide because I just sold it. I called the man back and told him the news, but he absolutely did not believe me. Logically to him, I sold it to the next caller for more money. If I were him, I would have thought the same thing. Bummer! Not only did I lose the sale and sustain the loss, but now a client thought I was a liar. Today it would have been easy to prove my innocence — just take a digital photo and send an email a minute later. Another time, I had a client visit my home to look at some lamps we had for sale. I put one of the glass lampshades on the sofa and randomly threw a blanket over the item. My wife didn’t notice what I had done and SAT ON IT! Luckily, my wife wasn’t injured. It would have been a difficult injury to explain. The shade already had some damage and wife finished it off. Embarrassing moments! Friday another interesting disaster story, but this one has a twist because of some chicanery. I guarantee you’ll want to read this one. No post on Thanksgiving. Have a HAPPY THANKSGIVING! Please send me your personal disaster stories. I’ll write a follow-up if I receive some good stories. Session 2 of James D. Julia’s Lamp & Glass auction was held on Friday, November 20. The session began with art glass shades, with rare and unusual examples holding up well, while common shades did not. The Tiffany Studios section of the sale followed with glass and desk accessories performing well. Lot 2091 was a Tiffany Studios flowerform vase that carried a pre-sale estimate of $4-6,000 and sold for $11,500, including buyer’s premium. 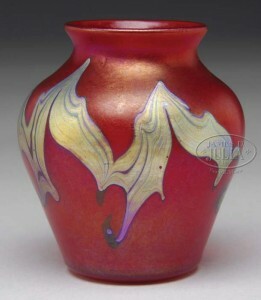 A mini red Tiffany Studios decorated vase, 3″ tall, estimated for $3-5,000, sold for $6,612.50, including buyer’s premium. French cameo glass was next up on the auction block. First was an outstanding vase by Eugène Michel with padded and heavily wheel-carved poppy flowers. It was estimated at $15-20,000 and sold for $25,300, including buyer’s premium. The three other Michel vases in the sale also did well. An outstanding Gallé marquetry vase, lot #2235, was estimated at $20-30,000 and sold within the estimate for $24,150. 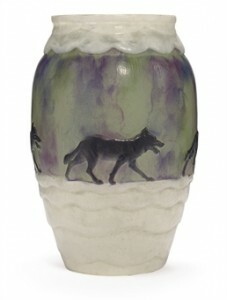 Bidding was spirited for several fine examples of Daum Nancy glass. A 5″ vase with blackbirds sold for $12,650, within the estimate of $10-15,000, while a bowl with handles and rare swan decoration sold to a New York dealer on the telephone for $10,925, including buyer’s premium, against a conservative estimate of $5,500-7,000. More than a dozen examples of pate-de-verre vases, boxes and pendants by Argy-Rousseau and A. Walter sold well, most within the estimates and a couple exceeding the estimates. 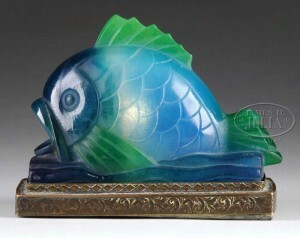 A Walter luminaire of a fish was estimated to sell for $3,500-5,000. It sold for $10,350, including buyer’s premium. I will be adding many new and exciting items to my website in the next few days and weeks, many of them at very attractive prices. Please check my website often for the latest. chasenantiques.com. I’d love to hear from you with suggestions or questions about art glass, lamps, Louis Icart, shows, auctions, etc. If it’s interesting, I’ll answer your question in a future blog entry. 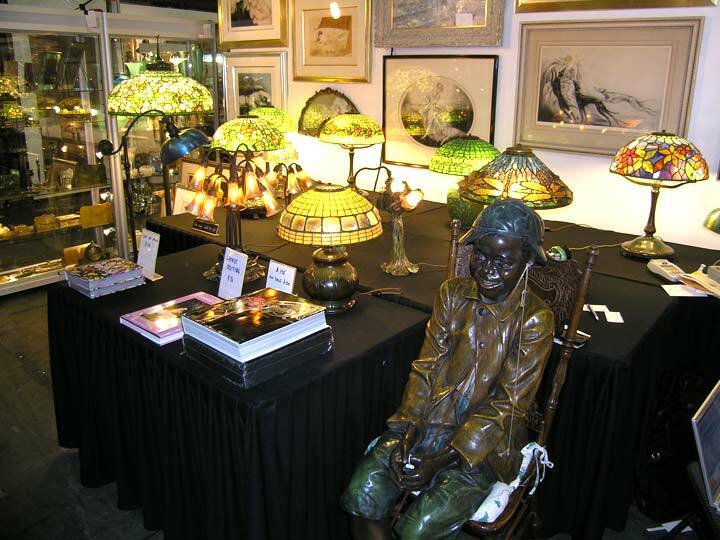 James D. Julia, Inc. held their semi-annual lamp & glass auction this past week, November 19 & 20. 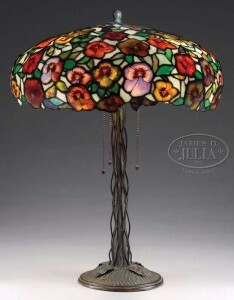 Both Jim Julia and their lamp & glass expert, Dudley Browne, were pleased with the results. The sale exceeded their expectations of $1.3 million, grossing $1.5 million. Leadership in the sale changed from previous categories of the last sale in Spring, 2009. This time the English cameo glass, Wedgwood Fairyland Lustre, Quezal and Steuben glass were weaker, while Tiffany Studios, French cameo glass and non-Tiffany leaded lamps were stronger. Today, I’ll review the lamp results and tomorrow the glass results. A beautiful 17″ diameter Dragonfly lamp with considerable damage sold to a dealer on the telephone for $40,250. If the lamp had less damage and a better base, it would have sold for a much higher price. Another 17″ Dragonfly in the sale, lot 2144, attracted little interest and failed to sell because of the aggressive estimate of $80-100,000. In general, lamps that were too aggressively estimated did not sell, including a 20″ diam. 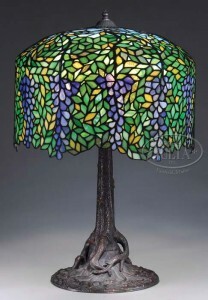 Tiffany Studios Arrowroot table lamp, lot 2125, estimated at $50-60,000. 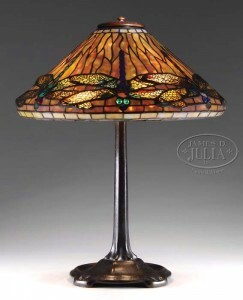 The sale included a large grouping of high-quality, non-Tiffany Studios, leaded lamps by makers such as Duffner & Kimberly, Handel, Unique, and Morgan. A unique Unique :>) wisteria lamp had an aggressive pre-sale estimate of $15-20,000, and still exceeded the high estimate, realizing a price of $25,875, including buyer’s premium — a surprisingly strong result. A pansy leaded lamp with hand-painted and fired flowers by the New York company of J. Morgan & Sons was estimated at $16-20,000. It easily exceeded the high estimate, selling for $26,450, including buyer’s premium. I wrote a blog post on November 3rd about a visit to my home of some local wild turkeys. My son, Billy, thought it was amusing enough to send it to the website reddit.com, so instead of the usual 100 readers to my website, I had 1000. That led to a call from the local Long Island newspaper, Newsday. A reporter there was writing a piece about the wild turkeys on Long Island and happened to read my blog. She asked if I could send her the photos I had taken of the turkey visit. I did and she used the photos for an article published yesterday in Newsday. That led to a call from the NYC TV station, WCBS, channel 2. The reporter there had read Newsday and wanted to come visit me to tape an interview. Unfortunately, being the good antiques dealer that I am, we were already on the road to Fairfield, ME, to attend the James D. Julia auction. Oh well, there goes my 15 minutes of fame. I did, however, email my photos to WCBS, and I suspect they’ll use one or two of them in their report. The timing of the WCBS report coincides with the start of a wild turkey hunt on Long Island this Saturday. Wow, that sounds strange. We don’t have too many wild animals on Long Island and we don’t have much hunting. New York State reintroduced the turkey to Long Island several years ago, where the count is now approximately 3000. That is apparently a sufficient number to warrant a wild turkey hunt on Long Island. It’s all quite amusing, for me, but not for the turkeys. Licensed hunters, with turkey permits, in Suffolk County only, will be allowed to bag one bird each. The hunters have from Saturday to Wednesday. I’m wondering what kind of a hunt it’s going to be. The turkeys are so tame they can be hand-fed. Are people going to choke them? Doesn’t seem too fair to me. I buy and sell a lot of French cameo glass, mostly from the Art Nouveau period, 1890-1920, and the Art Deco period, 1920-1940. Some of the highest quality glass from these periods is not cameo glass, but rather pâte-de-verre (pronounced pot, as in pot of stew). It was formed in molds from colored glass powders and heated in kilns until the glass solidified, a process called vitrification. Upon removal from the molds, the items were cleaned with hydroflouric acid, washed, polished and finished for sale. Decorators such as Henri Bergé and Joseph-Gabriel Argy-Rousseau created the original models from which the molds were made. Multiple copies of the same model can be produced with a mold, so the differences that are seen are in the colors. Depending on the choice of colors or the firing temperature, each example of the same model will differ in color, but not design. Collectors value some colors more than others, so the price will vary for the same model. Muted colors tend to be less desirable and therefore lower in price. Argy-Rousseau’s production included vases, sculptures, boxes, and pendants, whereas Walter produced very few vases. Argy-Rousseau’s most desirable models include animals like wolves or lions, or women, like ballerinas. Almeric Walter produced his best work after the end of WWI into the 1920s. 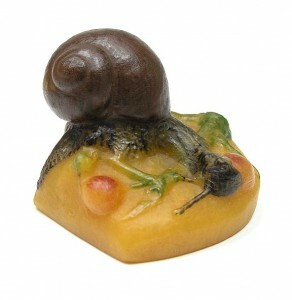 He is most famous for his 3-dimensional sculptures, especially with animals like lizards or insects like bees. He preferred to use opaque glass, whereas Argy-Rousseau used both translucent and opaque glass. The start of the Depression in 1929 impacted the production of pâte-de-verre glass dramatically. Interest and production waned significantly in the 1930s. The glassware was mostly forgotten for decades and rediscovered later. By the 1970s, it had become highly collectible and has been ever since. The Fall edition of the NYC Pier show is over. Attendance was extraordinarily good this time. The place was packed, but sales didn’t quite keep pace with the level of attendance and interest. It was a good show for me, but considering how many people were there, I was hoping for better. Tiffany desk set items and lamps garnered the most interest. In asking around to other dealers, the word was mostly good, with a couple who were disappointed. One gentleman, and I use the term loosely, came up to me and said “Cash. You know what cash is? If you give me a really good price, I’ll pay you cash.” Then he asked for the best price on a vase that was priced at $850. He offered me $500 (which happened to be my cost). I didn’t think it would be a good idea to laugh, but I wanted to. After that buildup, I thought we were talking about at least a $10,000 item. It was a hoot to see the cast of characters walking around. One man, who lost one leg and walks with crutches, likes to dress up as a pirate. He comes to every Pier show. I always enjoy seeing him. Then there was a very skinny guy in his 60s, with a ponytail, who came dressed in skin-tight leotards, a bra with falsies, necklaces, bracelets and long plastic earrings. He was quite the queen. He, too, comes to every Pier show. These were only two of the very interesting attendees, and there were quite a few more. The NYC Pier show is this weekend! 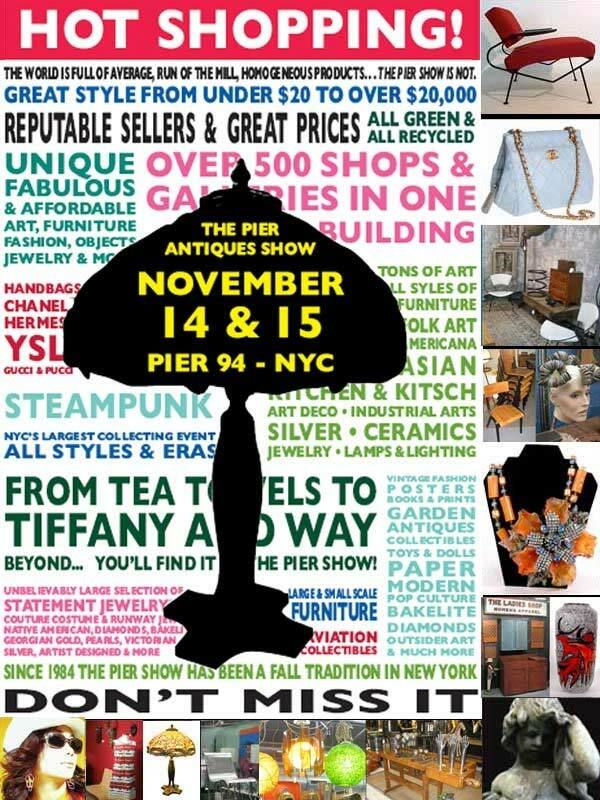 The NYC Pier Show is this weekend, Saturday and Sunday, November 14-15, 10 AM – 6 PM, both days. I always look forward to this show, because it has an old-fashioned combination that still works. The booth rent is reasonable enough for marginal exhibitors to still make a weekend’s wages. That permits dealers who sell vintage clothing or other fun inexpensive items to mix with dealers who sell very high end items. That eclectic mix gives the show a look that most other shows are missing. Irene Stella came up with this winning formula years ago, when the show used only one pier. 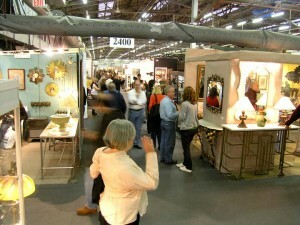 She expanded it to three piers because of the high demand from dealers to exhibit. It became known as The NYC Triple Pier Show and soon became a classic. Construction at the piers forced the show into the one larger pier, Pier 94, on the Hudson River at 56th St. Now the show has a “T” shape, with the higher end dealers to the left, the middle level dealers to the right and the “fun” dealers mostly straight ahead. It’s one of the few shows left that still has star power. There’s always a big line of patrons on Saturday morning before the show opens. They come charging in at precisely 10 AM, and the show gets off to a quick start. New Yorkers are enthusiastic, competitive and quick to make decisions, so frequently the action happens right away. Once sales start and items are marked sold, decisions get made even faster, to avoid disappointments. If you’ve never come to the show, you should. It’s a real treat to see all the great items on display and also the characters who shop the show. Sometimes they’re more interesting that the items in the show. What does an antiques dealer do on his day off? Easy. 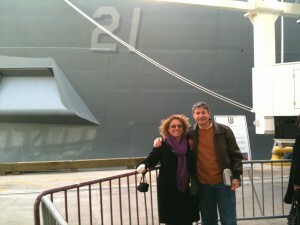 Take his wife to visit the Navy’s newest warship, the USS New York, while it’s docked in New York. And what a wonderful visit it was. Construction of the the USS New York incorporated 7½ tons of steel recovered from the debris of the World Trade Center, to forge the bow of the ship. Genius! 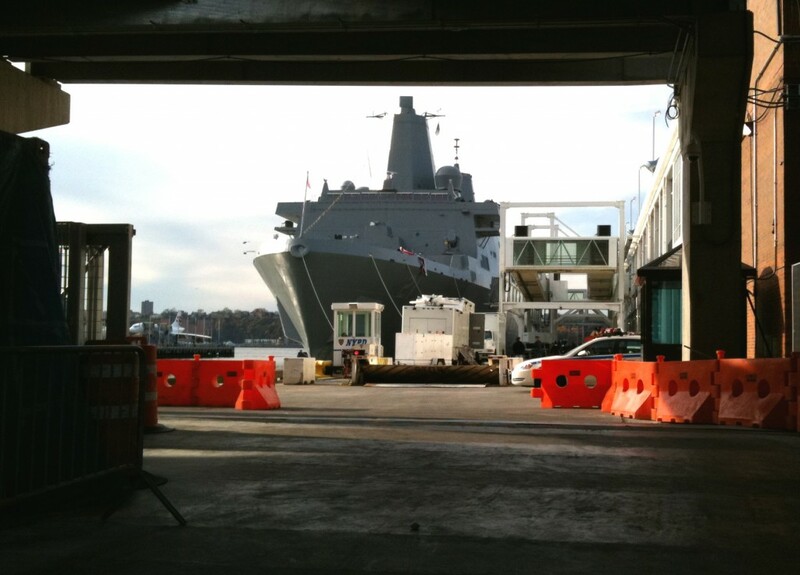 The ship is a San Antonio-class LPD (Landing Platform Dock) with all the latest bells and whistles a modern warship should have. Its main purpose is to deliver marines and their equipment wherever in the world they’re needed. Today was the first day the general public was allowed to visit, so we came prepared with newspapers and other toys to stand on the long lines we expected. To our surprise, there were no lines. Not sure why, but we were grateful. The weather wasn’t a factor because it was beautiful. I suspect as word gets out, there will be many more visitors on the weekend. The first thing we noticed was the security — young navy security guards with machine guns stationed up front. Navy and Marine personnel everywhere — all very poised and very friendly. They seemed genuinely pleased to see us and show off their impressive new ship. We visited two equipment decks with troop carriers and an Abrams tank, which we were allowed to crawl over and into. It got more interesting on the top deck, where helicopters and a VTOL (Vertical Take-Off and Landing) plane, the V-22 Osprey, were on display. 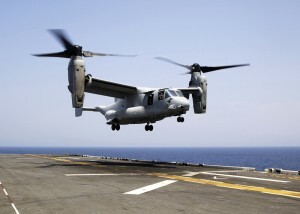 The Osprey can take off and land like a helicopter and then rotate the engines to fly like a standard airplane. Wow! It was all fascinating to me, but not quite as much to Lia. She was more interested in the human aspects of the ship. How do the sailors sleep and eat? So I mentioned this to one of the sailors, who by sheer dumb luck, happened to be the Chief Engineer of the ship, third in command. 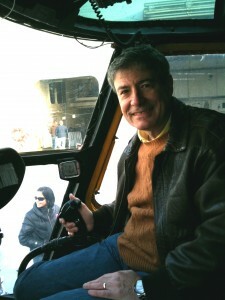 He invited us on a personal tour of the entire ship, from the mess hall to the engine room. What a treat! He couldn’t have been nicer, answering all of our questions while showing off his ship. So a big thank you to Lt. 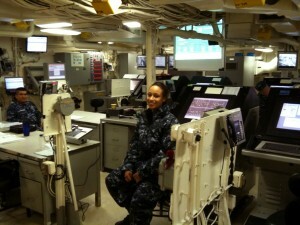 Commander Harris of the USS New York. By the way, did you watch the Yankees win the World Series? At one point, the camera zoomed in on the commander of the USS New York (who is a native New Yorker), seated next to Mayor Bloomberg. About 30 sailors were guests of the Yankees. 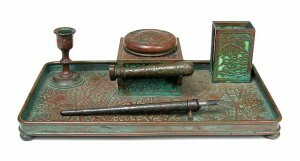 Tiffany Studios desk sets have become quite popular in the last few years. I think publication of the Kemeny book on Tiffany desk sets galvanized public interest. Since the publication of the book, prices have gone up 10-fold on many items. Some of the items show up repeatedly, so it’s a kick for me when I find a rarity. Even the rarities are still priced within many collector’s budgets, with a high of about $10,000 for most, except the nearly impossible-to-find Pond Lily pattern. Some of you may remember that a set of six Pond Lily desk items sold for over $200,000 at an auction in North Carolina about 2 years ago. The Pine Needle pattern has become more popular in the last year or so. 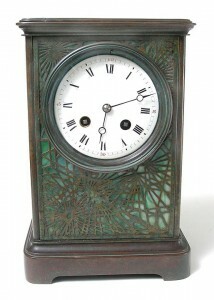 A clock is one of the items that’s quite rare in any Tiffany desk set. The pictured example had a beautiful patina. I never knew a combination tray, inkwell, wax seal, matchbox holder, and pen existed, until I was offered this one. This particular example was complete and had one of the best original patinas one could ask for. I wish I had 10 more, but then it wouldn’t be quite as rare. 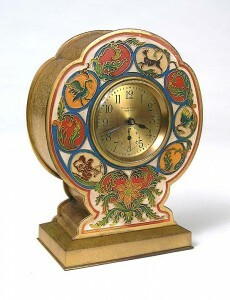 This clock is not part of the Zodiac pattern but it does have the signs of the Zodiac. It’s quite rare and in stupendous condition with colorful original enameling. Some Tiffany desk set items come with or without enameling. The rarer ones are enameled and those where the enameling is in great original condition are the rarest of all.